To sneak out to the barn in the middle of the night to check on your pregnant mare just one more time, in the air a feeling of impatience and excitement…the arrival of a long awaited foal is a special event for all horse lovers. What an incredible experience to witness your own horses birth and to know that from the very first touch for this special baby horse the human experience will be a trusting, respectful and gentle one. 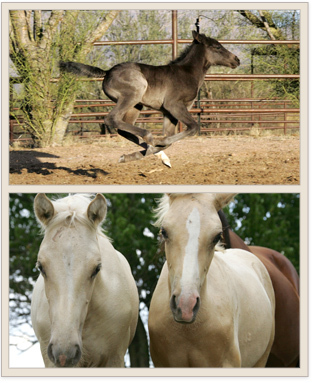 We want to make sure that when that foal matures it has all the traits and characteristics we feel are important in a fantastic riding horse: natural gait, physical beauty, and a great disposition. Big Sky Ranch proudly stands two magnificent stallions for your breeding consideration.